June 1 is Children’s Day in China, but for those left behind at the countryside, there is no Childrens’ Day, writes author Zhang Lijia in the South China Morning Post. 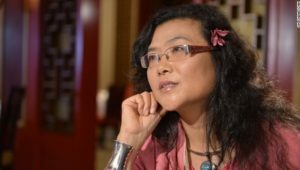 Earlier she wrote Lotus: A Novel on prostitution in China and is currently working on her next book on left-behind children. Every year, millions of urban children in China enjoy a day off on Children’s Day, spending it in parks or playgrounds, often accompanied by their parents. For children of migrant workers such as Jiachao, however, the occasion reminds them of their disadvantaged position. This year, with Children’s Day around the corner, my thoughts once again turned to this group of children. In the past three years, I have spent many weeks at a picturesque village named Jidao in Guizhou province to research a book on left-behind children. Here, driven by poverty and lack of job opportunity, more than half of the able-bodied villagers have left for the city, joining the biggest tidal wave of migration in human history. Zhang Lijia is a speaker at the China Speakers Bureau. Do you need her at your meeting or conference? Do get in touch or fill in our speakers’ request form. Zhang Lijia is in the middle of moving from Beijing to London.